We offer over 30 years of industry experience and will provide you with an unmatched level of experience and commitment to your home improvement project. 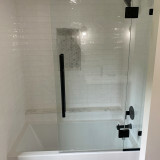 We've earned a solid reputation for all Glass Shower Door Enclosures, Installs and Repairs. We pride ourselves on the quality of our work as well as our commitment to outstanding results. We look forward to building long-term relationships with our clients and guarantee your satisfaction! References are available upon request. Give us a call today, and let's get started. Stained Glass Overlay 4025 Dixie Highway Elsmere, KY 41018, United States 859-727-4746 <a rel="nofollow" target="_blank" href="http://www.stainedglassbysgo.com/">http://www.stainedglassbysgo.com/</a> Stained Glass Overlay is one of the leading stained glass manufacturers and fitters in Elsmere, KY. We specialize in creating artistic leaded and stained glass images with appealing original designs to homes or businesses. What can a local Franklin glass company help me with? If it’s a major home glass repair or replacement, the Franklin glass company should work directly with your insurance company to help bring down costs for you, if applicable. Find Franklin glass companies on Houzz. Narrow your search in the Professionals section of the website to local glass, mirror and shower door services in Franklin, OH and read reviews and ratings to find one that fits your needs.